lonely but strong by design. of smoke when left and left and left. From Empire. Copyright © 2011 | University of Arizona Press. 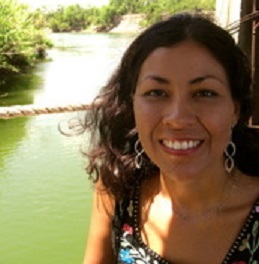 About the poet: Xochiqueztal Candelaria is the author of the poetry collection Empire (University of Arizona Press, 2011). She was raised in San Juan Bautista, California, and holds degrees from UC Berkeley and New York University. Her work has appeared in The Nation, New England Review, Gulf Coast, Seneca Review, and other magazines. She has also written articles for the online journal Solo Ella. Xochiqueztal received fellowships from UC Berkeley, New York University, Vermont Studio Center, Bread Loaf Writer’s Conference (2005, 2006), Hall Farm Center for the Arts, The National Hispanic Foundation for the Arts, Barbara Deming Memorial Fund, and the LEF Foundation. She was the winner of the 2006 Dorothy Sargent Rosenberg Poetry Prize, the Louisiana Literature Prize for Poetry, and the Gulf Coast Poetry Prize.